As someone who's expecting his first child later this year, I've already begun to drown in a sea of endless research about baby products. It's not all that bad, of course — it's a bit fun discovering all the innovative, tech-infused products out there. One that I didn't know about until now was Owlet's Smart Sock 2, which is a different kind of baby monitor. You can get one of these smart socks for $239.99, which is $60 off the original price (a 20% discount). There are only a few hours left on this Amazon Deal of the Day. The Smart Sock 2 is pretty much what it sounds like: a sock that you slip onto your infant's foot to monitor his or her heart rate and oxygen levels via the Owlet Baby Care app. 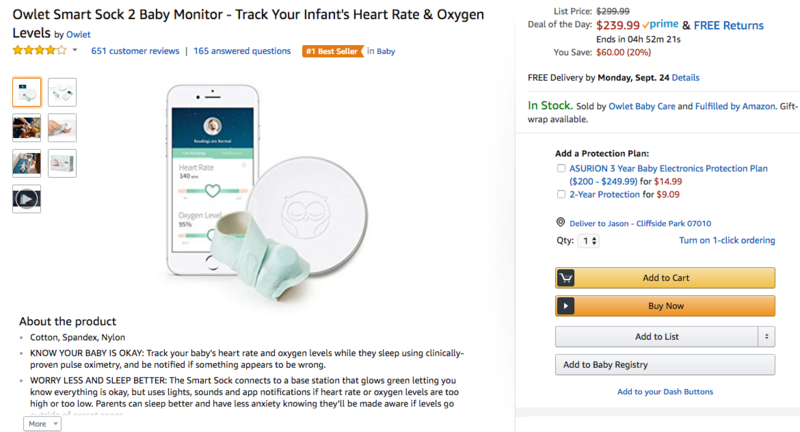 The selling point here is that rather than limiting themselves to just visual and audio monitoring, parents get a more detailed look at their infant's current condition. A base station comes with the sock and glows green when all is well. The smart sock connects to it via Bluetooth, and Owlet promises a range of up to 100 feet. The sock fits infants 0-18 months old, or anywhere from 6-25 pounds. The company suggests alternating the sock between the baby's right and left foot each night. Each unit comes with three hand-washable socks. Even at $239.99, it's a bit steep for my tastes, though I won't deny that I'm mighty tempted to splurge. The Owlet Smart Sock 2 is Prime eligible and can be returned for a full refund within the first 45 days. The deal expires in about 4.5 hours, so act now if you want one. But if you miss out, don't worry: It appears that the Smart Sock 2 goes on sale every now and then. Developer: Owlet Baby Care, Inc.